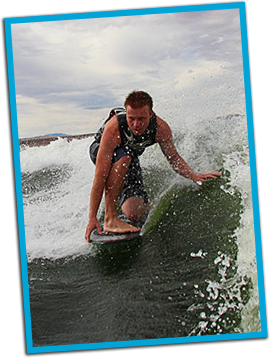 TK Water Sports Introduces full service Fishing Guide services at Lake Powell. Our guides are licensed and experienced providing guality service for over 30 years. If you are vacationing at lake powell want to take in the sites and enjoy fishing call us and reserve your trip. Large Mouth Bass, Small Mouth Bass, Stripers,walleye, crappie, catfish and carp are some of the game fish found at Lake Powell. Lake Powell is a year around fishery and can be fished with success throughout the year, the water temperatures range from 45 degree to 85 degrees so the water does not freeze over. Spring is one the most active times on the lake with the warm water bring the spawn, a great guide can take you to the right location with the right bate. Fall is one the most pleasant times on the lake still warm but with alot of summer traffic gone. Don’t have a boat??? Don’t need one come join us at Lake Powell. 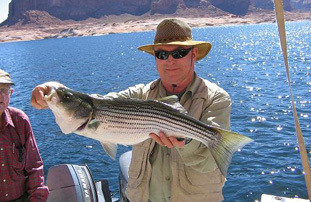 Take advantage of our fishing Guide service and fishing boat rentals at lake powell. Lake Powell Fishing offers a unique experience with over 2,000 miles of shoreline the views are simply breath taking and the canyons offer some of the best fishing in Arizona and Utah. The season typically runs from April to November. For a real challenge chase the boils for stripers in August well into September and October. Many of our clients come for their annual house boat vaction tip and book our charterd fishing guide service for a few days to make the most of there fishing trip. Some even throw in a few days of watersports with our VIP Watersports charters. We can arrange to meet you at your Houseboat and take you out on our fishing boat for the day. Lake Powell fishing guides Boat Launch from Stateline Marina located 1/4 mile past Wahweap Marina at Lake Powell Resort. Fishing licenses can be purchased at Styx Market on Lake Powell Blvd or at the Marina at Wahweap. The water is the place to be! Nothing beats fishing for bass in calm water against tall red canyons. Trips are private you group only.